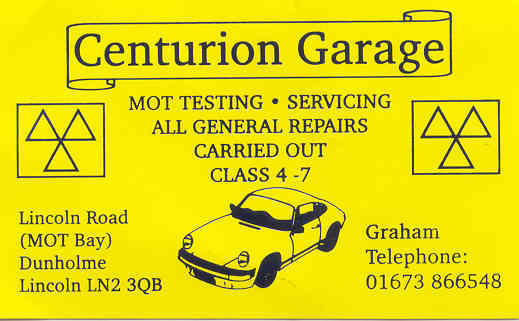 MOT testing and servicing at Centurion Garage-the white garage on the Grimsby-Lincoln junction, now under new ownership. For many many years Welton was very lucky to have its own petrol station and MOT testing station in the heart of the village on Ryland Road. Here you could rely on two experienced sensible engineers who gave realistic advice, yet upheld high standards of MOT testing-nothing serious ever got past them!!! Everybody in Welton and Dunholme must now be wondering where they can find an equally sensible approach to MOT testing. on Class 4 to 7 vehicles. By charging a fair and equitable rate for the skilled engineer's time involved in a thotough MOT-he is not the cheapest at around £40-Graham does not need to find unnecessary work to pass your vehicle.